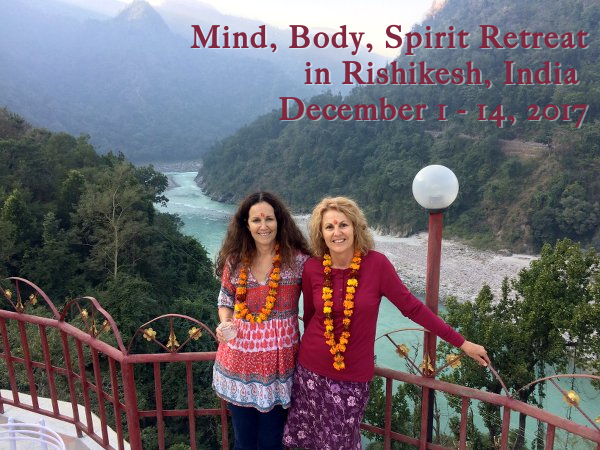 We have scheduled a get-together on Saturday April 1st, 3.00 pm at Yogaveda for those interested in finding out more about our Mind, Body Spirit Retreat in Rishikesh, India, December 1-14, 2017. Take time out from the stresses of daily living. Relax, unwind and connect to nature on the banks of the peaceful river Ganges at the foothills of the Himalayan mountains. 3 nights in a luxury hotel in central Delhi with breakfast. Includes a day sightseeing and shopping. 5 nights at the beautifully situated Divine Resort in Rishikesh with rooms overlooking the Ganges (breakfast included). Centrally located in Laxman Jhula amongst colourful shops, cafes and restaurants and a short stroll to the Ganges. 4 nights to relax and unwind at a peaceful retreat location with your own chalet. A magical setting located high above the Ganges surrounded by the tranquil Himalayan mountains. All Ayurvedically inspired meals prepared fresh from the organic gardens on site are inclusive. Yoga Classes – open to all levels – twice daily with Nikki Leaf, except on excursion days. Ayurvedic Consultation with Nikki or Leah. Ayurvedic full body massage – Snehana – with Leah. 1. Day trip to Devprayag visiting the sacred meeting place of two rivers – Alaknanda and Bhagirathi. All transfers inclusive – excludes airfares. If you would like to join us please contact us very soon as we have limited places available.